Sunset behind Halong Bay seen from Cat Ba Island in northern Vietnam. 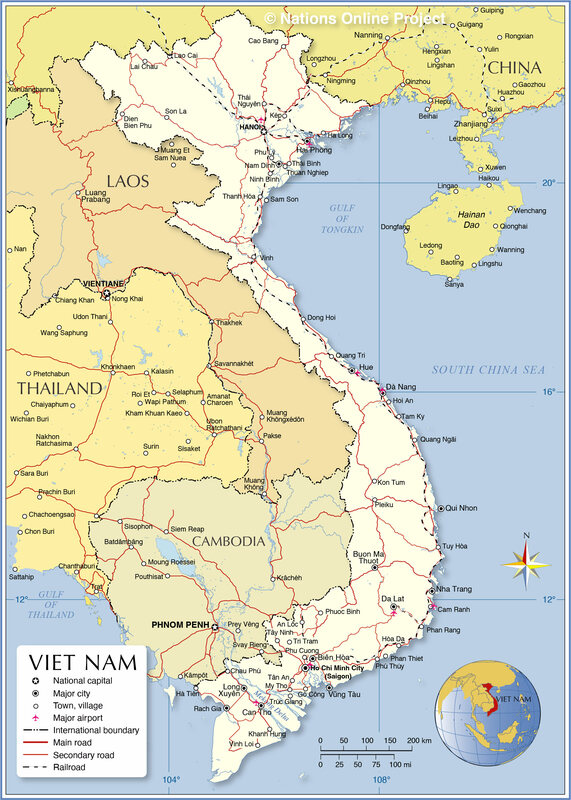 The map shows Vietnam, officially the Socialist Republic of Vietnam, a country in Mainland Southeast Asia. The nation is situated on the eastern part of the Indochinese Peninsula with a coastline along the South China Sea. It borders China in the north, it has a long border with Laos, and it borders Cambodia in the southwest. Vietnam shares maritime borders with Indonesia, Malaysia, the Philippines, and Thailand. The long stretched country covers an area of 331,689 km², compared it is about half the size of France, or slightly larger than the U.S. state of New Mexico. Vietnam has a population of 94 million people (est. 2018), the national capital is Hanoi, the largest city is Ho Chi Minh City (Saigon). Spoken language is Vietnamese. The map shows Vietnam and surrounding countries with international borders, the national capital Hanoi, major cities, main roads, railroads, and major airports. 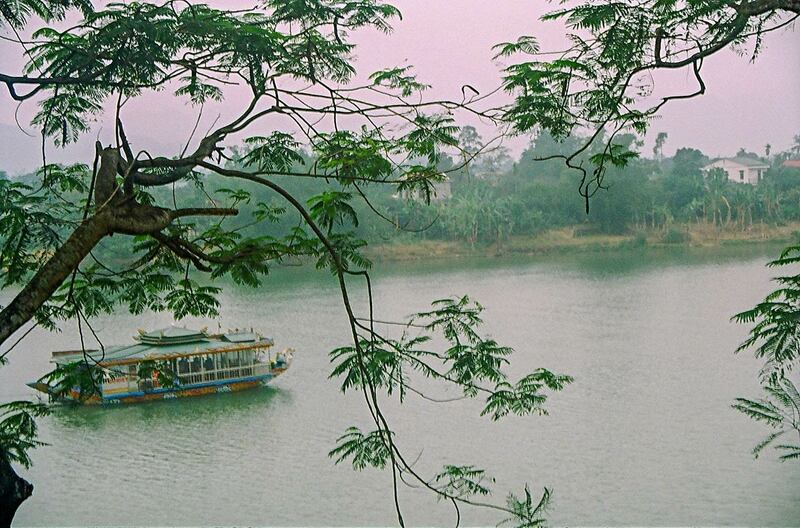 A rainy day in Hue, at the Perfume River in Vietnam. The main geographic feature in the north of Vietnam is the fertile delta of the Red River, the region where the cities of Hanoi and Hai Phong are situated. The coastal area to the east from Hanoi is famous for Halong Bay; the bay features thousands of limestone islands and islets in various shapes and sizes. Junk boats bring en masse tourists to the "new Seven Wonders of Nature." However, Ha Long Bay is a UNESCO World Heritage Site. To the north of the Red River Delta is the mountainous Northwest region of Vietnam bordering China. Lào Cai and Sa Pa are two important towns and popular tourist destinations in the Hoàng Liên Son Mountains. The mountains are the location of Fansipan (Phan Xi Păng), the highest peak in the Indochinese Peninsula at 3,143 m (10,312 ft). In Central Vietnam, between the cities of Vinh and Da Nang, you will find a narrow stretch of coastal plains with the Annamite Range (Dãy Trường Sơn) on one side and the South China Sea on the other. The plains are the location of Hue, the former seat of Vietnam's royal Nguyen Dynasty and for some times (1802-1945) the capital of Vietnam. To the southwest of Da Nang are Vietnam's Central Highlands (Tây Nguyên), a series of contiguous plateaus covering central-western Vietnam, a southern portion of Laos and a corner in northeastern Cambodia. The southern part of Vietnam is dominated by the Mekong Delta, the "Nine Dragon river delta," where the Mekong River spreads out into an extensive delta before it empties into the South China Sea. The delta is the site of the country's largest city Ho Chi Minh City, formerly known as Saigon. 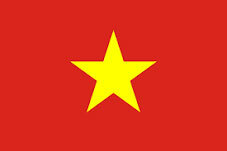 An Loc, Bien Hoa, Buon Ma Thuot, Cam Ranh, Can Tho (largest city in the Mekong delta), Cao Bang, Chau Phu, Dalat, Da Nang, Dien Bien Phu, Dong Hoi, Go Cong, Ha Long (Hong Gai), Hai Duong, Hai Phong (3rd largest city in Vietnam), Hanoi (capital city), Ha Tien, Ho Chi Minh City (Saigon, largest city in Vietnam), Hoi An, Hòa Da, Hue, Khanh Hung, Kon Tum, Lai Chau, Lao Cai, Long Xuyen, Muong Het, My Tho, Nam Dinh, Nha Trang, Ninh Binh, Phan Rang, Phan Thiet, Phu Cuong, Phu Lý, Phuoc Binh , Pleiku, Quang Ngai, Quang Tri, Sam Son, Tam Ky, Tan An, Tay Ninh, Thanh Hóa, Thái Bình, Thái Nguyên, Thuan Nghiep, Tri Tram, Trúc Giang, Tuy Hòa, Vinh Loi, Vinh Rach Gia, and Vung Tàu.